The Membership Committee reviews and approves all prospective member applications and makes recommendations to the Board of Directors as to guidelines for membership. It helps develop and evaluate member benefits, reviews special offers, and looks for new member-recruitment methods. Programs include the Annual Dinner and other member-networking events. Join the CFANY MEMBERSHIP COMMITTEE on LinkedIn. Kampoleak Pal, CFA, is a senior director specializing in equities risk management, commodities and hedging programs. He also manages all derivatives overlay activities including interest rate, currency, credit and equity derivatives. Prior to joining Guardian in 2008, Kampo spent two years at Constellation Energy, where he was a director in the global credit risk management group and was responsible for co-managing the credit portfolios and defining and implementing credit hedging strategies. Before that, he spent 11 years at The Dow Chemical Company, serving as a fixed income portfolio manager and financial risk manager with responsibilities that included managing foreign exchange exposure. Kampo has over 20 years of investment experience. Kampo holds an engineering degree in computer science from EISTI, Paris, and an M.B.A from the Wharton School, University of Pennsylvania. He has a Chartered Financial Analyst (CFA) designation and is a member of the CFA Institute and the CFA Society New York. Peter Sang, is a Research Analyst on Lazard Asset Management’s Emerging Markets Debt team covering global EM sovereign credits. Prior to joining Lazard, Peter was responsible for Enterprise Risk Management at ING Bank fsb. While at ING, he also had roles at ING Investment Management in the Latin America Investment Office. Peter also served as an Advisor for the Central Bank of Chile where he developed an Early Warning System (EWS) model of countries at risk of a sovereign downgrade in their international investment portfolio. Peter is a graduate of Columbia University’s Program in Economic Policy Management (PEPM), a specialized degree in economic policy making for emerging markets. Peter also has an MBA from the University of Western Ontario Richard Ivey School of Business and a Bachelor of Commerce from McGill University in Canada. David Motsonelidze is a Vice President at Stifel. He joined the firm through its acquisition of Barclays Wealth and Investment Management, Americas, where he worked since June 2012. In this role, Mr. Motsonelidze contributes to the creation of macro-economic investment ideas for high net worth clients. He is a member of the firm’s Investment Strategy Committee, through which he contributes to tactical asset allocation decisions and is responsible for ensuring they are adapted across five risk profiles. Mr. Motsonelidze’s areas of analytical specialty are global macro-economic issues and global equities. Prior to Barclays, Mr. Motsonelidze was an Equity Analyst at Bloomberg, covering global equities. In this role, he conducted industry research and built and maintained financial models to gauge companies operating and financial performance. Mr. Motsonelidze holds an M.B.A from Columbia Business School. 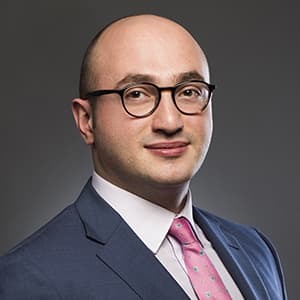 He also holds an MSc in Finance from Manchester Business School in the UK (graduated at the age of 20) and a BSc in Finance from International Black Sea University in the country of Georgia. He also has Series 7 and 63 licenses. He is a CFA® charterholder and a member of the CFA Society of New York, the CFA Institute, the Economic Club of New York and the New York Association for Business Economics. Also, he was awarded a George Soros Foundation scholarship to attend the American Institute on Political and Economic Systems in the Czech Republic (AIPES 2007), and is an alumnus of the Future Leaders Exchange Program (FLEX 2004) funded by the U.S. State Department. Ron Dadina has over 20 years of experience in corporate, structured and project finance transactions in Latin America and emerging markets. He is currently the Portfolio Manager in the LATAM group at Bank of Tokyo Mitsubishi (MUFG). He also served as the Chief Credit Officer of Minlam Asset Management LLC, a hedge fund based in New York. Before Minlam, Ron was a Managing Director in the Emerging Market Debt Capital Markets group at Bear Stearns. Prior to Bear, he held positions at MBIA and Fitch Ratings focusing on LATAM and emerging market structured and project finance transactions. Ron has an M.B.A. from the University of Chicago’s Booth School of Business. He is a CFA charter holder, a member of the New York Society for Securities Analysts and the Indian Institute of Chartered Accountants.